I come back to racing at the Belgian Grand Prix this weekend feeling great after probably the best summer break of my Formula 1 career. I went to some great locations and spent time with some amazing people and had a blast, doing a lot of sport and keeping myself busy in beautiful surroundings. I spent a few days at my house in Colorado, went to the Caribbean, where I feel very much at home and really enjoyed the Barbados carnival, and then spent a few days in New York before coming back to Europe for the second half of the season. There were some pictures of me at the carnival in the papers, but I couldn't care less about that. I was on holiday, doing what I wanted to do, having fun, enjoying the whole event. I was too busy dancing and just engulfed in the energy and atmosphere to even notice the cameras. It was an amazing experience. I've been to the Notting Hill carnival and the one in Grenada, where my family originally come from, but Barbados was way better. Trinidad is supposed to have the best one of all the islands, so I'll have to try to get to that as well next year. I'll be going back to Barbados, for sure, though. The weather, beaches, food are all great and the people are super-friendly. I feel like I'm at home there in many ways, because it is similar to Grenada in many respects. Don't think the fact we are on a summer break means it is one long party, though. Yes, I had a great time, but F1 is never far from your mind. You switch off from racing, but I really got on to my fitness and diet regime. On my first morning in my house in Colorado I treated myself to some pancakes, but after that I was on a healthy diet trying to lose weight because I was a little bit heavier than I wanted to be by the end of the first half of the season. I was weighing myself every morning and spending the days doing gym workouts and running from the bottom of the hill to the top, in the same place I go skiing in the winter. That is a killer. The first time I chilled out and had fun was in Barbados, but even there I was on my diet, although I did train less there than in the first week. But then I was back on the training when we went to New York, running along the river and doing some hard gym workouts. It was all about making sure I came back in the best shape I could because there is a long way to go until the end of the season and you need to be as strong and sharp as possible. The last race before the break, in Hungary, did not go that well for me and I spent some time thinking about that for at least half the first week I was away. You never plan to have bad days, obviously. It was like: "Oh. That's happened." Inevitably, it affected me - I am an emotional sportsman and I want to win. I started from pole, had a couple of incidents and finished sixth, so of course I was not happy after the race. But there is nothing you can do about it except learn from it. I wanted to consider how it had come to be that way and I think I've worked out how to rectify that moving forward and make sure that sort of thing does not happen again. Hungary was a bit of a blip but what is more important is that this has been a really strong season so far. 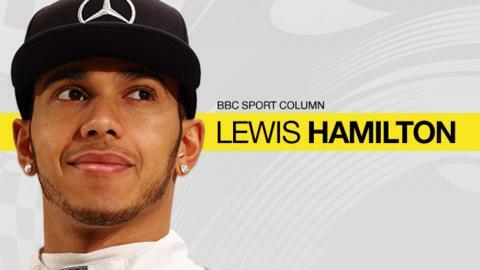 The way I look at it, I'm 21 points ahead of my Mercedes team-mate Nico Rosberg after 10 races, and I remember that at this point last year I was more than that behind - and I crashed out in this race. But I still went on to win the title. Of course, there are always things you want to be better, but I am grateful for what I have and am looking forward to ensuring the second half of the season goes at least as well as the first. If I drive like I have been so far this year, I should be strong. From this race, there is a change to the rules governing starts. The teams can help the drivers less in terms of preparing the clutch to be in the best possible position for a good start. More will be in the drivers' hands. No-one knows how that will play out, but after reflecting on it I think it is going to make F1 more exciting. I feel there are lots of positives in the change. There is the potential for better starts but also more potential for worse starts. But everyone is in the same boat so I don't feel anything negative about it. Everyone likes the Spa-Francorchamps track, where the race is held this weekend. It's definitely one of the best circuits in the world, but this is not a grand prix I have particularly loved in the past. It has rarely gone that well for me. The record books say I have only won here once - in 2010 - but I always think of it as twice, as I "won" in 2008 as well, only to be demoted to third after the race when the stewards decided I had broken the rules concerning gaining an advantage by leaving the track. I have had lots of ups and downs at Spa and it is a really hard race to win. Just look at Fernando Alonso - he has never won here. And he's a great driver who has been racing even longer than me. I know I can be quick here. But I also know it often seems to be a lottery, not least because the weather is so unpredictable here in the Ardennes mountains. Hopefully I can have a good weekend and finally notch up another win to get the second half of the season off to the best possible start. What makes the perfect heptathlete? Read more on Johnson-Thompson & Ennis-Hill: What makes a perfect heptathlete?